Flowsquare+ is a two- and three-dimensional computational fluid dynamics (CFD) software. 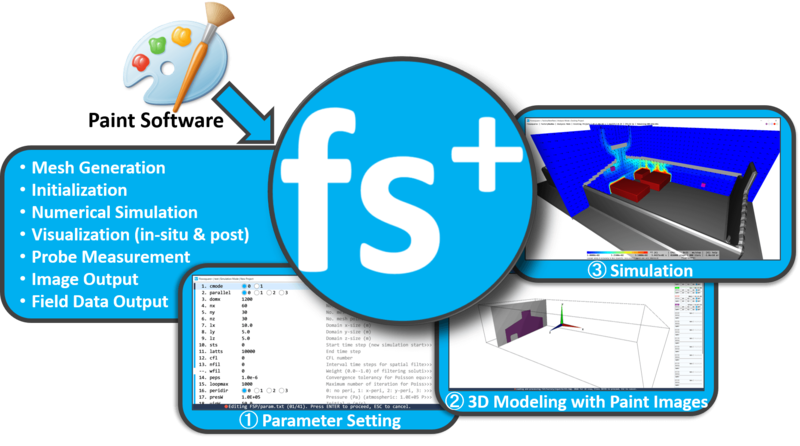 Flowsquare+ has a very handy and intuitive user interface which allows more users to perform their own simulations without too much cost and effort. A typical commercial CFD software costs at least tens of thousands $, and they require huge computational resources and high level technical skills, such as CAD, mesh generation, pre- and post-processing for simulation. Thus, many engineering companies comission their CFD analysis to outside consultancies these days. Flowsquare+ is available with free or very cheap lincenses, and runs on typical Windows PCs. You don't need to have professional skills to use Flowsquare+. Also, its real-time visualization tools help to understand the flow evolution more intuitively. Anyone can perform their own CFD with Flowsquare+! Flow of CFD (①→②→③) by using Flowsquare+. Performing CFD couldn't be easier with Flowsquare+! Your can construct a model based on a few illustrations generated using a paint software such as Microsoft Paint, thanks to its unique algorithm*. Of course, a CAD desinged model can be used for a simulation without any pre-processing such as mesh generation! Flowsquare+ can be applied to thermofluid problems such as heating/cooling of devices and rooms, and concentration transport problems of a substance such as pollutant dispersion, as well as typical fluid flow related problems. Flowsquare+ also includes many visualization and post-analysis tools, being an easy-to-use, integrated CFD tool. A simulation of room AC visualized by Lagrangian tracer particle colored based on local temperature. Flowsquare+ was developed and optimised for 64-bit Windows PC/laptops, taking advantage of the multi-threading parallel computing to accelerate the simulations on environments described below. Before downloading Flowsquare+, please read the license agreement and disclaimer. There are four license types for Flowsquare+ (the Software): Trial, Two-D, PRO (1 and 12 months) and Student licenses. With any of these license types, the users can use the software for non-commercial and for commercial purposes. Initially, the Software is alotted with the Trial lincense. To use the Software under a non-Trial license, each user must issue their own lincense, and borrowing and lending, sublicensing, assignment of the license in any form is prohibited. The developer of Flowsquare+ (the Software) makes no implied or express warranties about the reliability of the Software. The developer of the Software is not responsible for any damages caused by or resulting from the use of the Software. By clicking this checkbox, I agree to the license agreement and disclaimer. *If download is prevented by Windows SmartScreen, you can temporarily disable it by doing this. You can choose one from four license types below. If your desirable license type is not listed below, please contact us so we can arrange one for you (e.g. group license, customised Flowsquare+, porting Flowsquare+). This is a free trial license to use Flowsquare+, available right after doanloading the software without a license subscription. With Trial lincese, all functions can be used but the number of timestep advancements per simulation is limited to 300. To run simulation exceeding 300 timesteps, the user needs to restart the simulation. The user can check the software before purchasing the license with the Trial licnese. The Two-D license is the license for two-dimensional CFD and the available license term is one year. This is suitable for beginners to learn CFD. The 300-timestep limitation is only applied for three-dimensional simulations. The PRO license includes all functions without any timestep limiation for two- and three-dimensional simulations. The license term can be chosen from one month and twelve months. This license can be applied by students and it valid for one year. Once expired, the students can re-apply the student license as long as they are students. This license is on par with the PRO license in terms of capability. Summary of the license types. *The timestep increment for each simulation is limited to 300 timesteps. By restarting the simulation from the end of the previous simulation, the user can advance the timesteps infinitely. Flowsquare+ is developed and maintained by Nora Scientific, a small Japan based company with two guys and a dog. Yuki received his BEng and MEng from Tokyo Institute of Technology, and PhD from University of Cambridge. After a postdoc researcher appointment at Sandia National Laboratories in the US, he joined Tokyo Institute of Technology as an assistant professor, and also founded Nora Scientific. Hirotaka received his BEng and MEng from Tokyo Institute of Technology. At the graduate school, he was engaged in intensive research activities in the field of computatinoal non-linear dynamics. His in-depth knowledge of computer science contributes various aspects of Flowsquare+. Copyright © 2018 Nora Scientific. All rights reserved.